Sony announced the top-of-the-range APS-C format SLT-A77 in mid 2011, and it has remained one of the most highly desirable and accomplished semi-pro models ever since. It adopts a high-resolution 24-Mpix CMOS sensor with the firm’s SLT fixed semi-transparent mirror technology for continuous shooting up to 12-frames-per-second at full resolution. The A77 also has a high-resolution EVF and combines a 19-point full-time PD-AF system (with 11-cross type sensors) with object tracking via CD-AF using the image sensor. As with other SLT models from the firm, and the reason for the technology in the first place is that the A77 maintains both real-time viewing with the EVF and the PD-AF capabilities during stills and video capture. All this and the semi-pro build have kept this camera at the forefront of the market since its introduction. Our labs have analyzed the optical quality of nearly 40 lens models from both Sony and third-party makers on the SLT-A77, and while not as comprehensive as some of our previous round-ups it’s still a significant and useful sample. We will be analyzing more lenses from Sony and others with the SLT-A77 and adding the results to our inter-active database as they become available. In the meantime, some of the Sony models evaluated with the SLT-A77 include the Sony DT 35mm f1.8, and Zeiss Vario-Sonnar T* DT 16-80mm f3.5-4.5 models and some exotics including the Zeiss Distagon T* 24mm f/2.0, Sony 70-400mm f4-5.6 G SSM II, Zeiss 85mm f1.4 and the longest lens from Sony currently, the 500mm f4 G SSM super-telephoto. Third party models haven’t been overlooked either. We’ve analyzed the extreme ultra-wide DT format Sigma 8-16mm f4.5-5.6 DC HSM, as well as the firm’s 17-50mm f2.8 EX DC HSM and remarkable 35mm f1.4 DG HSM A models. We’ve also included Tamron’s previously impressive SP 24-70mm f2.8 Di USD full-frame standard zoom, as well as the earlier more accessibly priced SP 28-75mm f2.8 XR Di version, which is still available. Please note we’ve not yet seen the new high-speed Sony DT 16-50mm f2.8 OSS SSM or the Sigma 18-250mm F3.5-6.3 DC Macro OS HSM, but they should be available soon and they will be added to our interactive database in due course. As we’ve seen with other makers it’s the less extreme focal lengths that are easiest to correct for image degrading aberrations. It will come as little surprise to learn that lenses in the 35-85 mm range consistently achieve high-image quality. However, that assumes a moderate maximum aperture. Models with ‘fast’ maximum apertures are exponentially more difficult to design and manufacture. In order to reduce aberrations to an acceptable level they require a more complex optical construction with more elements and exotic glass types, all of which are reflected in the price. At $1,426, Sony’s Zeiss branded 85mm f/1.4 is the best performing lens on the A77 and even outperforms the state-of-the-art Sigma 35mm f1.4 HSM A. In third place, with slightly higher sharpness levels than Sigma, is the modestly priced Sony DT 30mm f2.8 Macro SAM. In addition to the useful 1:1 (life-size) magnification macro feature, as the equivalent to a 45mm it would serve double duty as a standard or ‘normal’ lens. Although it has a ‘slow’ f2.8 maximum aperture, it’s still good value at $300. The Tamron SP AF 60mm f2 Di II LD (IF) Macro and Sony DT 35mm f1.8 SAM, in fourth and fifth place respectively, are also notable for their reasonably modest price and good optical performance. While few macro lenses can boast of fast maximum apertures the Tamron is one of the exceptions, but bear in mind, though, it’s made specifically for APS-C size sensors with an equivalent field of view to that of a 90mm. The Sony DT 35mm f1.8 SAM is another model made for APS-C size sensors and while it may not have the overall image quality of the Sigma 35mm f1.4 HSM A series lens, it’s a good deal smaller and lighter. However, the best value in our prime database must be the $150 Sony 50mm f1.8 DT. As a small and lightweight equivalent to a 75mm this lens may still be on the short side for portraits, but it is sharp in the center. While pricey models such as the $1,599 Sony Zeiss Vario-Sonnar T* 24-70mm and $1,799 Sony 70-200mm f2.8 G series model head up our database, it’s refreshing to see lenses like the Tamron SP AF 28-75mm f2.8 XR Di LD Aspherical (IF), Sigma 17-50mm f2.8 EX DC HSM as well as some Sony DT models rank highly. The older Tamron 28-75mm f2.8 XR Di model even outperforms their newer 24-70mm f2.8 Di USD version, particularly with regard to sharpness on the smaller APS-C size sensor. However, as a 43-115 mm equivalent, it maybe a touch ‘long’ for a lot of tastes, and the wider Sigma 17-50 mm f2.8 as the equivalent to a 26-77 mm may be more appealing. At $569, the Sigma is also modestly priced for an f2.8 constant aperture zoom. Although not inexpensive at around $750, the Sony Zeiss Vario-Sonnar T* DT 16-80mm f3.5-4.5 is more in keeping with the build of the A77 and it’s a good performer even if it looks to be close in performance to the now discontinued Sony DT 18-70mm f3.5-5.6 kit lens from a few years ago. As for high-grade telephoto zooms, the Sony 70-400mm and 70-200mm f2.8 G-series models stand out as good performers, the latter coming second in our rankings. 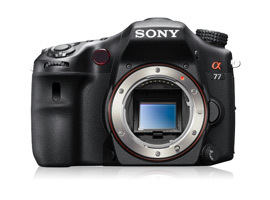 However, sharpness is slightly below par at the longer focal lengths on both models on the A77. While this is slightly disappointing in both cases, Sony has announced an upgraded 70-200mm f2.8 SSM II model, which sounds promising, if somewhat pricey at $2,999. As we’ve not had the opportunity to analyze that many wide-angle lenses with the A77, we thought listing the two ultra-wide zooms we had seen together with the three wide primes in our database would help put the optical performance in perspective. Both the 20mm and 28mm film era lenses are, unsurprisingly, eclipsed by the modern design of the Sony Zeiss Distagon T* 24mm f2.0. Sharpness isn’t quite as high as we expected on the A77 but this is a top-tier lens with excellent aberration correction. However, as a full-frame lens it’s the equivalent of a not-so wide 35mm. Unsurprisingly, the Tokina AT-X 116 Pro DX is ahead of the Sigma 8-16mm f4.5-5.6 overall but both are appealing for the capabilities. The Sigma is particularly tempting given the extraordinarily wide angle of view but sharpness is low and, even then, mainly restricted to the center regardless of focal length. Although full-frame primes generally achieve high image quality they’re an expensive option for APS-C format cameras and, like rival makers, Sony has yet to offer much of a choice of DT (APS-C) format equivalents (though to be fair they have more models than most). While the Sony Zeiss 85mm f1.4 ZA is the best performing lens in our database on the A77, as the equivalent to a 135mm it’s usually more suitable for portraits outside than indoors. Sharpness levels are good but still someway behind our expectations, given the maximum 24P-Mpix theoretical maximum score achievable on the A77. At $150, the Sony 50mm f1.8 DT stands out for both image quality and price, but, unusually, as this is a DT (APS-C) format lens it can’t be used on full-frame bodies without cropping, like most other 50mm lenses leftover from the film era. The often-overlooked Sony 85mm f2.8 SAM is another good performer. This lightweight compact full-frame lens is little soft wide open but uniformity across the field is very good and sharpness improves when stopped down. At $249 it’s also modestly priced. Tamron’s SP AF 60mm Macro is also worth a mention. At $499 it’s a little cheaper than the Sony 50mm f2.8 Macro but it has good sharpness across the frame on the SLT-77 and, with an f2.0 maximum aperture, it’s unusually bright for a macro lens. Like the Sony 50mm f2.8 macro, it has a very useful maximum 1:1 (life-size) reproduction ratio without the need for extension tubes. Thanks to its highly corrected optical design, Sigma’s new full-frame 35mm f1.4 HSM A achieves the highest DxOMark score in this group but, unexpectedly, sharpness is slightly lower than the $325 Sony DT 35mm f1.8 or the ultra-fast 35mm f1.4 G. However, bear in mind with the latter model there’s only a slight improvement in center sharpness when stopped down and there’s a hefty $470 premium to consider. In all other respects the Sigma is the better-corrected model. As for the DT 35mm f1.8 it has consistent sharpness from edge-to-edge when stopped down to f2.8 and beyond on the A77, while the softer, wider apertures make it particularly suitable for environmental portraiture. At $300, the modestly priced Sony DT 30mm f2.8 model is good value as both a macro and a ‘normal’ lens. It has good central sharpness but this never extends to the outer field, the edges or corners, even when stopped down. That’s disappointing in a macro but not so much of an issue for a general-purpose standard lens. Full-frame models continue to dominate our rankings for image quality, but they have price tickets to match. Sony’s Zeiss branded 24-70mm f2.8 and 16-35mm f2.8 ZA models perform well, as you might expect from modern designs of this pedigree but there are some more accessibly priced third-party offerings that perform very well. The Tamron SP AF 28-75mm f2.8 achieves a good DxOMark score of 16 points and at just $499 is in ranked second in this category. Surprisingly, the newer full-frame Tamron 24-70mm f2.8 doesn’t perform as well as the earlier iteration. At any given aperture or focal length it’s simply not as sharp or as homogenous across the field. In fourth place the Sigma 17-50mm f2.8 (26-77mm equivalent) has a good overall DxOMark score and is well corrected but it has slightly disappointing sharpness – the lowest measured of this group. If lens speed isn’t critical, the APS-C format Sony Zeiss DT 16-80mm f3.5-4.5 offers good all-round image quality and a versatile range but that comes at a price. Out of the telephoto zooms we have in our database, the best performing model is the pro-grade 70-200mm f2.8 G with a DxOMark score of 17 points. Although this lens is sharp at the shorter end, sharpness is disappointingly low at 200mm and at $1,799 it’s a pricey option already. Sony has announced a new SSM II version complete with the new anti-reflective Nano coating, but at $2,999 that’s huge increase over the current model. Sony’s high-end G-series 70-300mm f4.5-5.6 G SSM and 70-400mm f4.5-5.6 G SSM II models both benefit from quiet ultrasonic type AF motors and have good sharpness, low chromatic aberration, vignetting and distortion at the shorter end of the zoom range, but inevitably neither model can maintain that level sharpness at 200mm or above. In fact sharpness is somewhat low across the image field on both models, including the edges and corners. While not unexpected at this focal length, it’s a slightly disappointing result, as either of these two zooms would be particularly attractive when paired with the smaller APS-C format of the A77. If you have a Sony Alpha SLT-A77 and a favorite lens, we would very much like to hear from you. Please leave a comment below, stating what lens it is and why you like it.